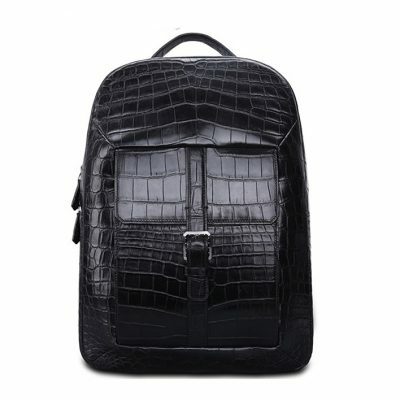 Crocodile backpack and alligator backpack for sale, all these genuine crocodile skin backpacks, alligator skin backpacks are free shipping. We only offer high-quality and high-end genuine crocodile backpacks, alligator backpacks to our customers. The main materials we use in all of our exotic leather backpacks are the high-quality genuine crocodile and alligator leather. And like all our luxury leather goods, they are guaranteed for life. To ensure our crocodile backpacks, alligator backpacks with the best quality and best performance, we arranged some very experienced leather craftsmen in our production line. 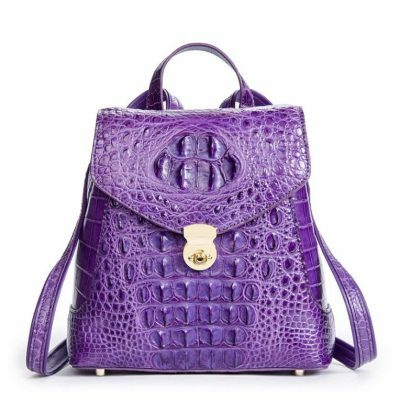 Hope that every crocodile backpack and alligator backpack can be a beautiful work of art, which can stand the test of time. Crocodile and alligator skins are undoubtedly a deluxe, supple material used in a variety of applications today. Today, this material is very much in demand, especially in the fashion industry. 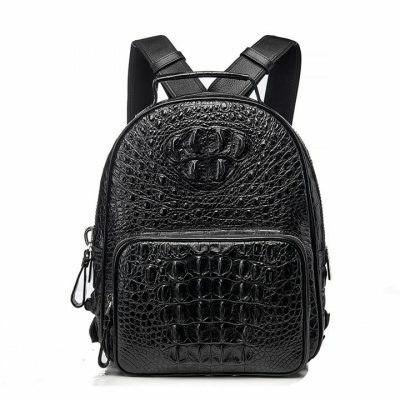 Famous brands from all over the world have recognized the unique beauty and fantastic value that this material provides that is why crocodile and alligator skin backpacks now abound in the industry. 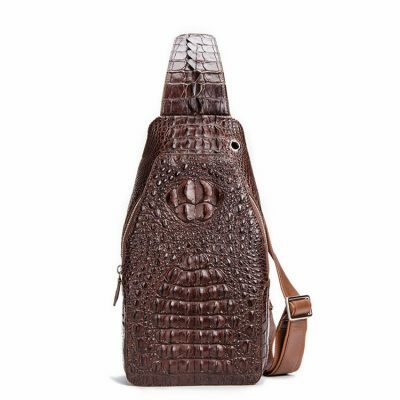 If you are looking for a stylish, roomy and unique bag for all your outdoor adventures, you will never go wrong with a crocodile skin backpack or alligator skin backpack. This backpack material will surely make you stand out and an envy of other backpackers. 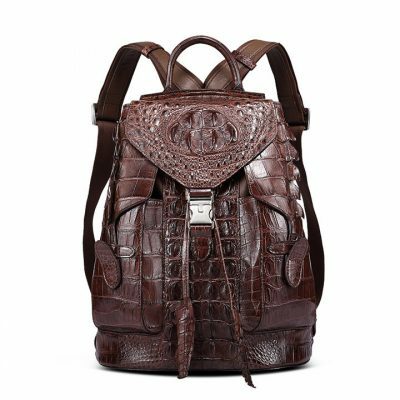 A luxurious, high-quality crocodile skin backpack and alligator skin backpack can be a source of pride, especially for backpackers, and it can serve you well for a long time. Aside from their elegant feel and appearance, they can also offer durability, prestige and great functionality to users. Thus, alligator skin backpacks and alligator skin backpacks make excellent items to buy and gifts for your loved ones. 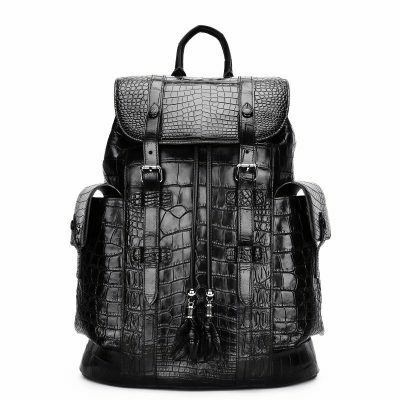 Experience the style and convenience of BRUCEGAO’s crocodile skin backpack and alligator skin backpack. Each wallet from BRUCEGAO is designed in Italy, crafted from the highest quality genuine crocodile and alligator skin. 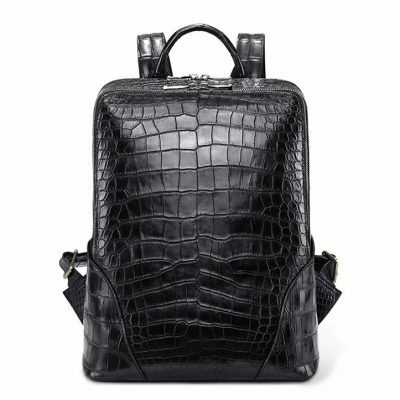 Crocodile and alligator backpacks are ideal for school, work, traveling and hiking. You can put laptop, wallet, keys, iPad, tablet, glasses, cell phone, water bottle, umbrella, clothes, books, or others in the backpack. 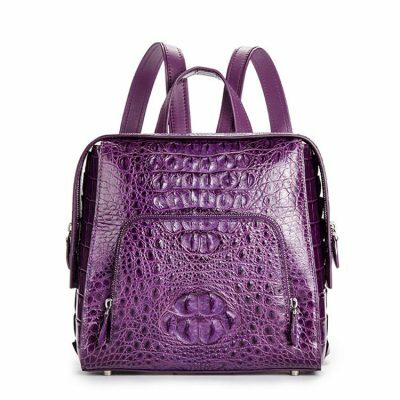 For premium crocodile and alligator backpacks in an assortment of appealing colors, shop the collection at BRUCEGAO today. The fashion trends change so rapidly that sometimes it gets hard for individuals to follow the industry. However, when it comes to the backpacks you have to assure that you buy the best quality latest backpack because you are going to use it for a long time. There are many individuals who want the best backpack as they have to keep several electronic gadgets and devices in their backpacks. It means that they cannot afford to invest in any low-quality item that might waste their time and money. When you will visit the market to buy your new backpack, there is a huge variety of products you will come across. Each one of them will have unique features that are hard to find in the other products. However, you should have a backpack that has all the features. We know that you are wondering how you can find a product with all the features. Do not worry because the crocodile backpack or alligator backpack is the product that you should have. Here we have some of the amazing reasons why crocodile backpack and alligator backpack will be your best choice. When you visit the market to buy your new backpack, the first thing you will consider is the quality of the product. The quality you will find in the Crocodile backpack and Alligator backpack is not available anywhere else. It is manufactured with the best quality crocodile or alligator skin. A special high-quality thread is used for the stitching of the product to assure that you will get the best products. The biggest attraction of the backpack is that it has to go through a special testing process to assure that it will not get damaged easily. 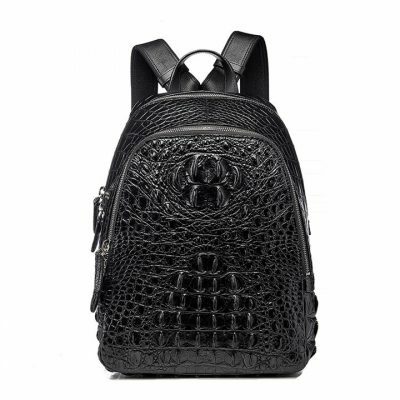 It is the quality of the Crocodile backpack and Alligator backpack that makes it the best. There are many individuals who prefer to have stylish products when it comes to investing in the backpacks. They do not invest in the simple products that have no appeal. 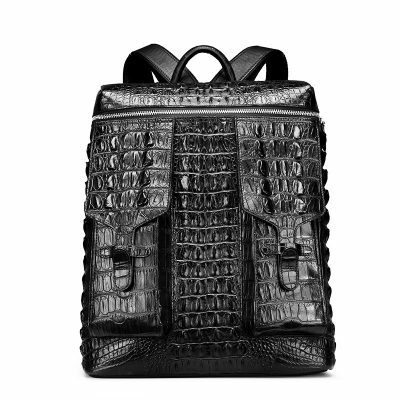 The Crocodile backpack and Alligator backpack are very stylish. The pattern of the skin is always unique. You will notice that everyone will be attracted by the design and pattern of the product. It seems like you have invested in a high-quality branded backpack that is not easily available in the stores. Everyone will appreciate your style sense. The most important features that we need in our backpack is durability. We all know that backpack is the product that has to be used for a long time and investing in the product that will last only a few days is not an option. 2. It will not undergo any kind of wear and tear which means that you will get the durability that you need. 3. Some of the backpacks are polished after they are manufactured to enhance the durability and appeal of the product. 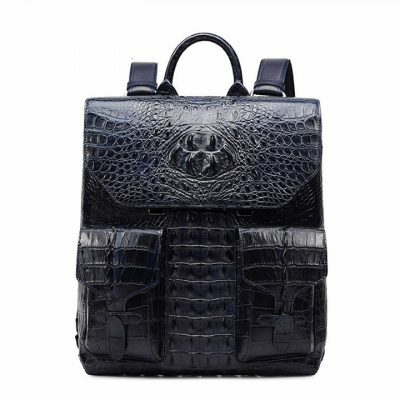 One of the best thing about the Crocodile backpack and Alligator backpack is that it is very unique. There is a special pattern of the skin that is not available in the market easily. We all know that natural beauty is the real beauty and man-made items can never compete with the products that have been made by nature. You will not be able to find an alternative for the Crocodile backpack and Alligator backpack in the market. Once you will invest in the backpack you will know that you have invested in the best quality item. The biggest attraction of the Crocodile backpack and Alligator backpack is that you will not have to protect the items that you will keep in the backpack. 1. The skin is naturally sturdy. It means that even if the backpack falls to the ground your items will not be affected. 2. Your Crocodile backpack and Alligator backpack is waterproof. It means if it starts to rain and you do not have any shelter, you will know that water will not enter your backpack. 3. It will give you the peace of mind that your backpack will not get damaged from the UV rays because the skin will naturally resist the rays. 4. It means that you will be able to use the backpack for a longer duration than you have thought. It is not all about the style and quality of the product. Cost of the item is the most important thing you have to consider to assure that you can easily manage the buy the product. 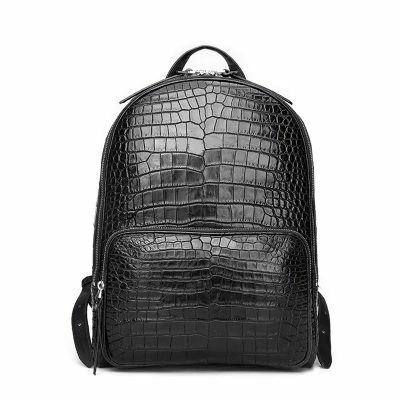 Most people think that Crocodile backpack and Alligator backpack is very expensive and they will not be able to afford it. However, they do not pay attention to the long-term benefits that come with the product. It means that if you will buy the Crocodile backpack and Alligator backpack you will not have to invest in another backpack for a long time that will help you save a lot of money. Always pay attention to the long-term benefits that you will get by using the product. Changing your style is something you should keep trying and investing in the Crocodile backpack and Alligator backpack is one of the things you must do at least once in your life. The style and design of the product will change your overall look. Even if the backpack is simply designed you will notice that everyone will ask you from where you have bought such an amazing product. Most of your friends will appreciate your style. So, assure that this time you do something different from the rest. have the biggest collection of backpack available in the store for you. 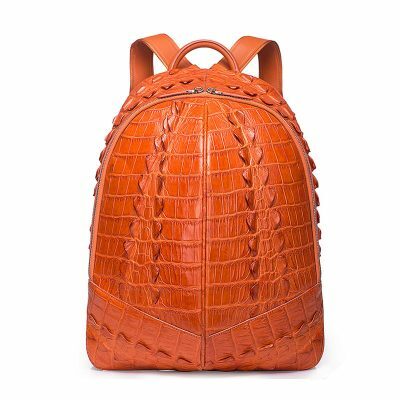 You can get the backpack in the original colors of the crocodile skin or invest in a different shade. In addition to the luxurious feel and look they provide, alligator backpacks and crocodile backpacks are also stylish items you can give your loved one. However, these backpacks can be quite pricey. 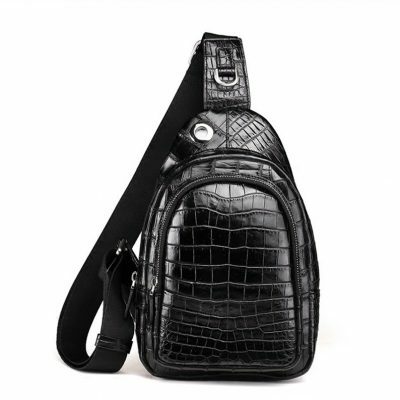 Therefore, if you are thinking of buying an alligator or crocodile backpack or you already have one, proper care is important to fully enjoy its functionality. While they tend to last for a decade or more, knowing how to take good care of your crocodile backpacks and alligator backpacks is crucial to protect your investment. Choose the right product for the Material. The best way to care for your exotic leather item is to simply keep it dry and clean. Never use any conditioning or cleaning products that are designed for cow leather, as these products can damage the material. The crocodile and alligator skin require special conditioners designed for this specific material in order to avoid damage and retain its natural surface sheen. Cow and other animal skin conditioners can affect the appearance of the material. The Application. Before you apply the conditioner on your backpack, it is best to test it first to avoid any costly mishaps. If you don’t have scraps, just apply it on a small portion of a hidden part of the backpack and evaluate the results. When to Clean your Crocodile and Alligator Backpacks. Ideally, cleaning your alligator backpack and crocodile backpack should be done every few months. Clean your backpack with a clean damp cloth or a cleaner that’s specifically designed for this exotic material. Conditioning is an essential part of the process, after cleaning the backpack, you should moisturize, replace the lost emollients and reseal the leather. If you want a more natural way to clean, moisturize, condition and reseal your backpack, a great natural product to consider is beeswax. Get a light coating of an extra-fine beeswax, rub it into the leader and lightly buff off. This is all that’s needed to protect and preserve the skin. 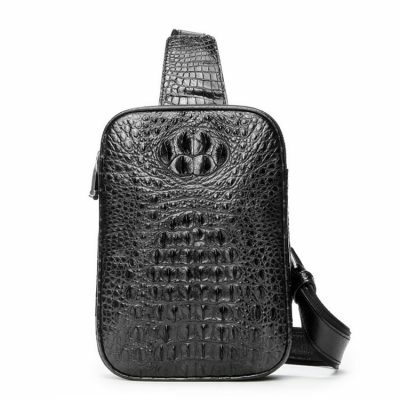 When it comes to storing your crocodile and alligator backpack, you want to ensure that you preserve its glamour. To do this, make sure to keep your backpack in a cool and dry place. Avoid storing it in areas that are prone to humidity like the attic or basement. As much as possible, protect it from direct heat sources. This is because very high temperatures dry the product, which can fade the dye and damage your backpack. You should also ensure that the leather item is stored in any unstressed position. 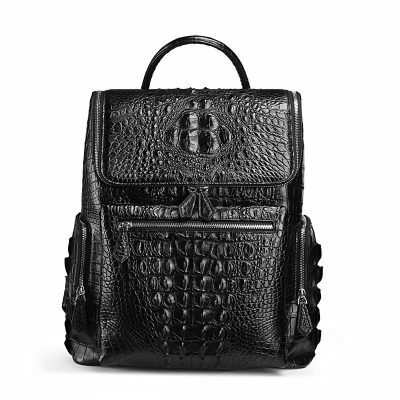 Your crocodile backpack and alligator backpack can be one of your most valuable investments. Therefore, it is important to observe proper measures in caring for your treasured item.